Here is a great news for all the bloggers. 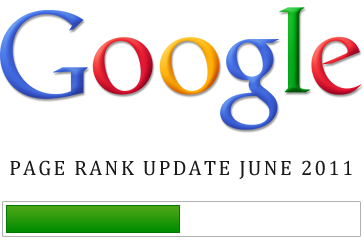 Google is now updating the Page Rank for blogs and websites for second time in year 2011. Earlier Google updated page rank in January this year. I am more than happy to announce that TricksDaddy is now PR 5 blog. Earlier it was PR 4 for long time. My other blog TheTemplateBank which was announced in January this year has also got PR 3. It seems like both these PR updates are gifts from Google for my birthday which falls on 2nd July. I was not expecting any PR this time as my blog got hacked this year. All the files on my server were removed and I was getting a lot of 404 errors for most of the posts but thanks to Google for PR increase for my blog. I have a domain name http://www.bloggerreflex.com which do not have any content at all, has also got PR 1 which is a good news for a blog without content. I hope you guys have also got good news from Google. Please share with us if you have seen any PR update for your blog. Glad to hear that you like the new design of TricksDaddy. Congrats dude, I have also got pagerank 5..!!! Many many Congratulations for such a tremendous success. Yes, I always have a value time at Tricksdaddy. I have visited the TemplateBank, all of the themes are really neat & professional looking. Congratulations – You got extra Page Rank – But my rank dropped I don’t know why – I really disappointed from this Google Update. I really work hard during this period but I don’t know where I do mistake. Any how Congratulation again. I think you haven’t done anything to get links to your blog. Page Rank depends mostly on the back links and the quality of back links. Well done on the PR, it’s always nice to know that Google is looking after you. My blog has dropped down to PR3, which is still ok for me. Nice to see you after long time here at TricksDaddy. Well I wish you good luck for next PR update. You are right that blogs with good quality rank will rank higher but I don’t think that page rank effect the search engine rankings of any blog or website. This PR update was also google for me i have 3 site and all of them got rank by PR of 2 . My page rank jumped to 3 from 0. love u Google.